I had been wondering this recently, but it looks like we just don’t have any organizing locally. I could be wrong. I think that @BrandonPHX was organizing the last qualifier and final of the Southwest Circuit (SWC), but I haven’t heard anything about ANRPC over this area this year. There is nothing in their website as well. I know that other regions, such as the Midwest, already had some events this year. We could try to check with some of the ANRPC organizers if there is anybody we could contact in the southwest. Maybe @spags could know? Don’t believe they had the interest to run a circuit. Could run a one-off event there, if you’d like. I’d absolutely love to volunteer to help in any way I can… if it’s in San Diego. I’ll be the first to put my name down to attend anything in LA, though. I’ve got some experience running tournaments. Also based in SD, but willing to work with Game Empire/Gameology/whoever up in LA as needed. Definitely interested in an LA or San Diego tournament - or perhaps OC as the middle ground? If you are considering a one-off event, I’d recommend a team tournament. It has the feel of a mini-circuit. The way we did it in Michigan, is a few months before the event, I asked the Michigan T.O. 's (basically the T.O. 's that run the store championships) if they were interested in putting together a team for a team tournament. We had 6 stores that were interested in sending a team of four players. Whoever was interested stepped up to be the captain/organizer of their store’s team. They had the freedom to choose their team however they wanted. For my team, I had a GNK tournament for whoever was interested in being on the GYGO team and the top 4 made it. The farthest out team was 2.5 hours, but everyone else was within an hour. California can probably do 2-4 of these. I talked to one of the stores about setting aside a 6-hour block of time for 20-40-person event. I got in touch with our local GLC rep about getting some ANRPC prizes. Five dollars per player was enough to cover 2 GNK, ANRPC dice for every player, as well as custom playmats for each player of the top team. But, the biggest prize was playing a whole event as a team where each faction is represented equally and can table-talk. I think it’s more difficult to do circuits in areas of the US, due to how spread out everyone is. However, I agree with @tvaduva, and make a big deal of it. I know @vinegarymink is planning some thing similar in the U.K., and in Scotland recently I believe they had a weekend long series of events. If you make it like that, you’re more likely to get higher attendance. If you need prize support and whatnot, I can do my best to help. I really like the team tournament idea! I have never ran any tournaments, but maybe, since I know @tvaduva, I could talk to him to get some hints and try to run a similar event over here with the help of other more experienced people. Great, I was going to drop your name if there seemed interest, but you beat me to it. @tzeentchling brought up on WCN that for that format to work it may be best to skip the play in rounds and just do a KoS style event where you pick a team and attend. Makes it easier to coordinate without having to put it like… the week before Worlds or something. Cool, glad there’s already interest/momentum to do a team-style event. Our event was based on KoS, but we just had stores be the de facto teams. It was a bit less overhead for me running the event, since I only had to keep track of stores (with one point of contact) that were interested instead of having to somehow keep track of all teams that may be fluctuating. There’s several of us here on the forums that have run them, so we’ll be happy to help with our experience. We most likely have a home for an event if it happens in San Diego. I’m currently reaching out to some people in LA since that may be better if people want to drive in from a little further out. @inniscor and I proudly announce the Prince of Surfers tournament! 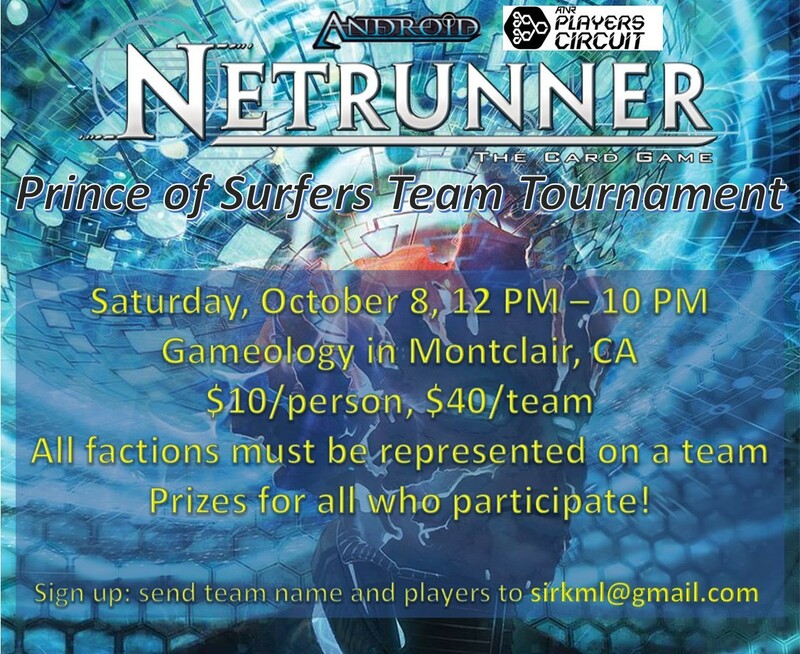 Mark Saturday, October 8th down in your calendars for the Prince of Surfers team tournament, sponsored by the ANRPC! The tournament will be held at Gameology, in Montclair, CA. Now accepting applications from teams to sirkml @ gmail dot com. Entry fee is $10/person. All entry fees will go towards prizes for participants! Players will compete in teams of 4, matched against other teams in a swiss-style tournament, with the number of rounds determined by the amount of teams signed up. Each round will be 65 minutes. Check-in, payment, and last-minute registration will begin at 12 PM (when the store opens) and the first round will begin no later than 1 PM. Teams must represent all four corp factions and all three main runner factions between them, with the fourth runner being any identity not already used by another teammate. NAPD MWL 1.1 will be in effect for this tournament. Costumes/themed team names and attire are encouraged! Any questions can be addressed to this thread, or to sirkml @ gmail dot com. We’ve got our first sign-ups! The Hollywood Renovation team, out of LA, are our first contenders for the crown! 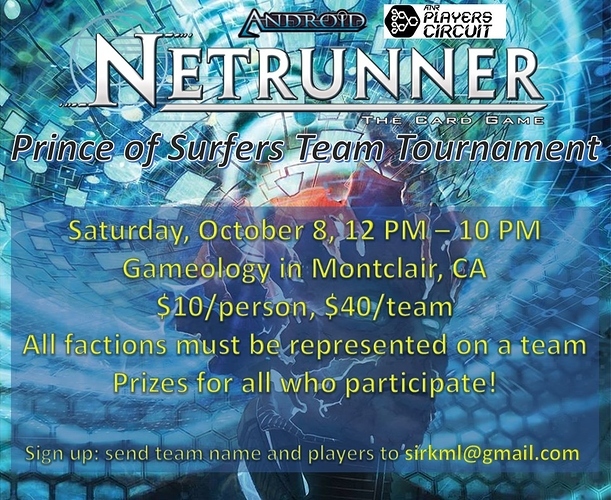 Also, if anyone is interested in playing this format, but doesn’t know 3 other people to make a team, let me know! Send an email to the address above along with your name and what factions you can play, and I’ll try my best to be a matchmaker with others in a similar spot.